Now that below-freezing temps are a daily occurrence, locking yourself inside with a queue of You, Roma and Tidying Up with Marie Kondo sounds like a solid plan. Eventually, though, the need for fresh air and/or human interaction will sneak up on you. When that happens, these spots are waiting with warm and fuzzy vibes, great eats and fun people watching. Just make sure you take an Uber there and back. It’s no surprise that Shoo Shoo is intimate—chef Shimon Maman’s last restaurant was the aptly named 12 Chairs. His new spot mixes Tel Aviv’s bohemian café culture with NYC style. With whitewashed brick, subway tile, natural wood and brass accents, and a pale blue-green bar topped with Carrara marble, the space is undoubtedly chic, but it’s also super cozy, thanks to crushed-velvet jewel-toned banquettes in the back and pedestal tables throughout. The design echoes Maman’s contemporary spin on Mediterranean comfort food, with fresh takes on staples like hummus, falafel and shakshuka. Let’s face it, this list would be incomplete without a Waverly Inn mention. It’s a New York institution at this point, set in a carriage house that dates back to 1844 and served as a tavern, bordello and teahouse before it became a restaurant. Vanity Fair’s Graydon Carter turned it into a celeb favorite, but he held on to the elements that made it most charming: low ceilings, plenty of fireplaces, uneven wood floors and a hidden garden with an ivy-covered brick wall. Nowadays, it’s less uber-exclusive and more of a romantic neighborhood gem with interiors that are v. old New York. Menu favorites include chicken potpie, Dover sole and a decadent truffled mac and cheese. This snug Williamsburg café is très Parisian…or at least very Paris meets Brooklyn. The bistro opened last year on a quiet corner and quickly became a neighborhood favorite with its Instagram-worthy decor and lively ambience. The star here is the roast chicken, served from a rotisserie on display in the dining room. But the menu features other classic dishes like moules frites, escargot, hanger steak and an amazing Camembert-stuffed burger. It’s chouette (“super”), as the French staff might say. If you’ve ever waited an hour or more for a spot at the Dead Rabbit, you’ll be happy to hear that the FiDi mainstay is expanding within the next few months, all while holding on to the intimate downtown vibe that made it famous. (The cozy Irish pub meets New York cocktail den was twice dubbed the world’s best bar.) Both the drinks and the design take a cue from history—think exposed wood beams, framed photos, porcelain teacups, sawdust floors and an ambitious cocktail menu (try the Pillow Fight, made with gingerbread rooibos tea and black currant liqueur). The food is no slouch either, with dishes like lamb shepherd’s pie and a corned beef sandwich. Il Buco is far from new or trendy, but the rustic kitchen on cobblestoned Bond Street is a classic, serving some of the best Italian cooking in Manhattan. It opened as an antique store nearly 25 years ago and evolved into a full-fledged restaurant within a few years. Today, antiques still fill the space even if they’re no longer for sale. Dig in to a seasonal menu of house-baked bread, hearty risottos and rotating entrées, and don’t leave without sampling one of the homemade pastas. The extensive wine list deserves a mention as well: Bottles are housed in the restaurant’s 200-year-old underground wine cellar, which also serves as a private dining room—and is rumored to be haunted by Edgar Allan Poe, a former resident. You’ll likely have to wait for a table at this crowded Hell’s Kitchen joint—and for good reason. It may look like many of the no-frills Thai places that dot the neighborhood, but Pure easily serves up some of the best shophouse-style Thai in the city. 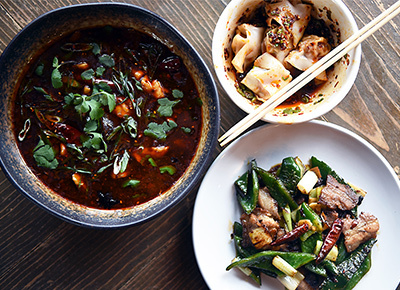 Expect all the classic menu items, such as veggie spring rolls, beef brisket steamed buns, pad see ew and a wok chili turmeric stir-fry, all with varying levels of spiciness to really warm you up. The tiny, railroad-style restaurant is jam-packed with tables, making it lively and loud but strangely intimate at the same time.